On the beaches of Daytona in the 1930s, a weatherbeaten farmer by the name of Marion MacDonald changed the course of automotive history with a length of rope and a pocketknife. MacDonald, nicknamed "Mad" because he used to eat hamburgers while racing, was one of many drivers who challenged the sands of Daytona, rocketing across both hardpacked and shifting sands. And like all the other drivers of the time, MacDonald raced without a seat belt of any kind. Cars tended to flip with metronome regularity on the sand, and the thinking ran that being thrown from the car was far preferable to being trapped inside it, either underwater or amid burning fuel. Problem was, without any form of restraint, drivers tended to slew back and forth across the front seat, making an already difficult task — driving across sand — damn near impossible. As Yahoo! Sports own Jay Hart tells it, MacDonald hit upon the idea of belting himself into the car with a rope. And in order to prepare for a quick exit, he taped a pocketknife to the steering wheel to cut himself free. Still, pocketknives are tricky to open even when you're standing still. How did MacDonald plan on fiddling with a knife while the world collapsed around him? Why, he kept the blade out, of course. Welcome to Daytona Beach. Racing is different here. Nine days before the 2012 Daytona 500, Trevor Bayne wheeled his No. 21 Ford Fusion off the pavement at Daytona and onto the beach. Though Bayne isn't even old enough to rent a car on his own — he was exactly two years old when Jeff Gordon drove his first NASCAR race — he nonetheless appreciated the history of his route. 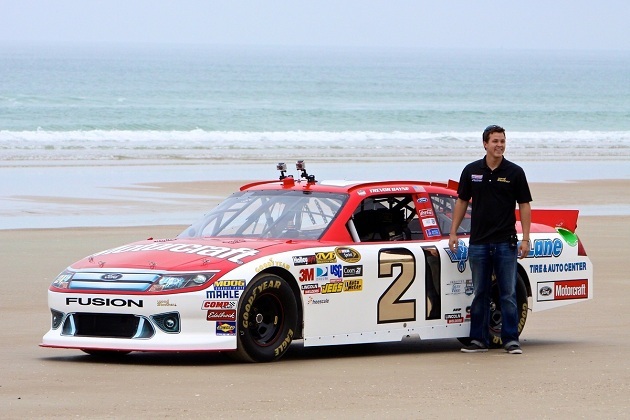 "This is probably the coolest thing I've got to do outside of actually racing on other tracks," said Bayne, still flashing the impossible innocence he showed in winning the 2011 Daytona 500, a storyline that kickstarted NASCAR's most successful season in years. "As a racecar driver you watch races of the beaches and I wish we could come back here and get the groove all rutted up and try to miss the potholes, but this is an unbelievable feeling — being on the beach where it all started. This is history right here." The world once believed that if you somehow managed to travel faster than 75 miles per hour, the air pressure would rip you apart from the inside. Granted, this was the turn of the twentieth century, but it was at Daytona Beach where a man named William K. Vanderbilt disproved this theory by going a then-record 92 miles per hour. He launched a half-decade of thrill-seeking and speed-chasing on the Daytona sands, days that prized speed above safety and sanity. Segrave walked the beach, judged it carworthy, and on March 29, 1927, proceeded to unleash a three-ton, 1,000-horsepower beast called the "Mystery S" across its surface at a speed of 203.79 miles per hour. In racing, then as now, speed is nothing in itself; speed is only worthwhile if you've got someone fading in your rearview mirror. So as news of Segrave's accomplishment trickled out across the globe, daredevils of all stripes journeyed to Daytona to test themselves against the record and against themselves. One way or another, something always broke … the car, the record, or the man. In 1928, Frank Lockhart tried to break Segrave's record but ended up establishing a far more dubious mark. Attempting to crack the 200 mph barrier, Lockhart sent his Stutz Blackhawk pinwheeling into the waves. He survived that crash and immediately set about planning a second attempt; the second time around, six weeks later, he wasn't so fortunate. Lockhart was the first recorded racing-related fatality at Daytona, the first in a line that stretches all the way to Dale Earnhardt himself in 2001. Still, for the barnstorming types, the ever-present specter of death was the cost of doing business, and both drivers and investors sought to challenge Segrave's record. Later in 1928, a driver named Ray Keech actually pulled it off, driving a "car" that was basically a chassis powered by three aircraft engines. The so-called "Triplex" rocketed down the beach at a speed of 207.55 mph. When Segrave managed to reclaim the record by ticking off a speed of 231.44 mph, Keech folded, declaring that "there is not enough money in the world to get me back in that hot seat." A local by the name of Lee Bible didn't have quite the same standards, however, and strapped into the Triplex, all smiles and good cheer. He "only" hit 202 miles per hour before losing control of the car, flipping into the sand dunes at the far end of the beach track. The wreck killed both Bible and a photographer who saw the carnage unfolding and made the unfortunate choice to run straight into the path of the car. Drivers dying was one thing, but a spectator losing his life introduced a whole new element of danger to the race equation. With the vast crowds that gathered along the beach to watch, the Land Speed Trials organizers knew they were one malfunction from a massacre, and before long speed hunters took their vehicles west to the Utah's Bonneville Salt Flats. The final record at Daytona, set in 1935 by Sir Malcolm Campbell, stands at 276 miles per hour. 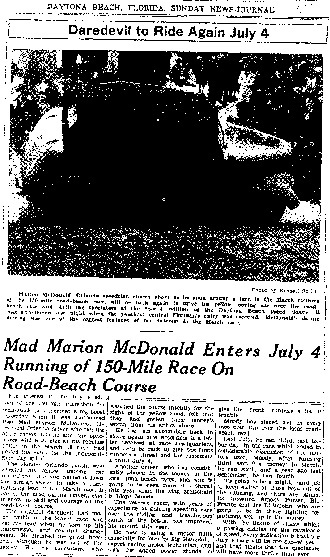 Still, Daytona had already earned a rep as a hub for speed, and city leaders hit upon another way to keep that fire stoked: a race course running a mile and a half up the beach and the same distance back down a parallel paved road. The first race, held in 1936, was scheduled to run 250 miles and was restricted to street-legal family sedans built within the last two years — the equivalent of restricting the Daytona 500 only to late-model minivans with "my child is an honor student" bumper stickers. Alas, within 75 laps the cars had carved the sand in the turns to a dusty, almost impassable mess, and the race ended right there. But the seeds of what would become NASCAR were already present in the person of the fifth-place finisher, a gas station owner by the name of Bill France. Eventually, France founded what is now NASCAR, banding together drivers, car owners and local mechanics at the Streamline Motel across the street from the beach in a now-legendary 1947 summit meeting. The France family has held a hammerlock on NASCAR every minute of every day ever since. For nearly 20 years, cars ran on the sand at Daytona, and even before NASCAR itself came into existence, drivers were exhibiting the same kind of think-on-the-fly automotive genius that enables drivers like Kyle Busch to keep their cars on the track even as the field pinwheels around them. 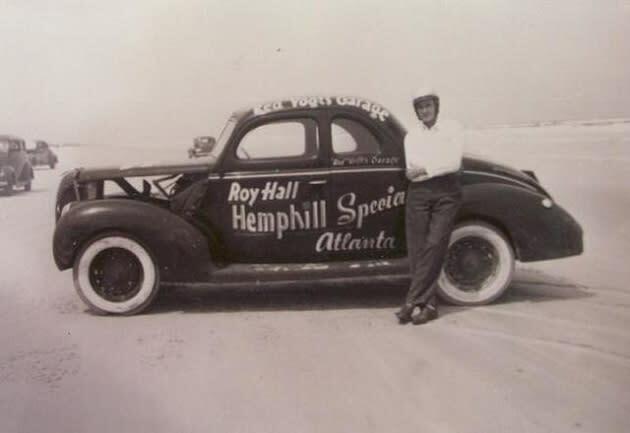 One of the earliest hellraisers was a driver named "Reckless" Roy Hall, who honed his automotive technique running illegal moonshine through the hills of North Georgia. Traditional race strategy for the beach-and-road course held that you drove all-out in the straightaways and eased off the gas in the softer transition sand at the turns. Hall ditched that strategy in favor of keeping the hammer down in the turns; the move would lift his left-side tires off the sand in the turn but, if executed properly, made him all but unbeatable when he ran on the beach. You can draw a direct line from Hall and his compatriots to Earnhardt and, today, Tony Stewart: drivers who wrung performance out of their cars that others couldn't imagine, much less emulate. An Indy Car driver in 1936 sniffed that "getting in a car and just keeping the accelerator jammed to the floor won't be what is needed" at the beach, then went out and proceeded to dunk his car while trying to run a "smart" qualifying lap. Savvier drivers would run at the very edge of the surf where the sand was firmest; the spray from the waves would cover their windshields so much that they'd have to lean their heads out of the window to see where they were going. The antics of Hall and others drew race fans to the beach, but common sense wasn't exactly in high supply. Fans would stand just a few feet from the speeding cars, and local newspapers would beg fans to keep away from the track, as "a fatal accident might be caused by a foolhardy decision." Many drivers would dump their cars into the ocean rather than take out an unaware fan who had obliviously wandered into their path. Cars flew into crowds and stands with terrifying regularity, but whatever force protects drunks, fools and little children also kept the fans safe and mostly unharmed. Still, rare was the driver who didn't have to flip over his overturned car, by hand, while dodging still-running drivers on both sides. Even as NASCAR began to take root at tracks around the south, cars still ran in the sand at Daytona through the mid-1950s, even though crowds topped 30,000. Jealous of a major new track built in Darlington, S.C., France made plans to construct one of the world's true landmark tracks, Daytona International Speedway. The track opened in 1959, and from that moment on, racing on Daytona's beaches was effectively over. Strangely, though they're well aware of the legends, even if many of NASCAR's veteran drivers have never taken wheels off the pavement at Daytona. "I was born the year they opened the [Daytona International] Speedway here, so I haven't had an opportunity to race on the beach," Mark Martin says. "I've been around for a long time, but not quite that long ... It would be a lot of fun because you can slide those cars around." "Never drove it, but I went to the North Turn restaurant the other day and had lunch and looked at the pictures," Michael Waltrip says. "You go into a corner and catch a rut wrong and you flip. These old guys would point and say, 'I flipped over there, I flipped over there.' It was so challenging, flying down the beach." For more on the topic, check out Neal Thompson's Driving with the Devil and Darrell Waltrip's Sundays Will Never Be the Same, both of which were consulted for this article.